Home » Backyard Living » Growing, Rooting and Propagating Dappled Willow in Tree Form from Cuttings. The easiest and most predictable way to grow Dapple Willow, Salix integra ‘Hakuro Nishiki’, from cuttings is to do them as Hardwood Cuttings in the Winter. They can be done as Softwood Cuttings in the Summer, but that can be a bit tricky. But as hardwood cuttings they are very easy to root. Roger Higgins with a Dappled Willow that he grew from a really long hardwood cutting. Plants in the willow family are the only plants that I’ve ever seen rooted with really long cuttings. All other plants are best done with about a 5″ cuttings. But willows root easily and you can do them as really long cuttings. In this photo Roger Higgins is showing off a Dappled Willow that he rooted with a really long cutting, probably 30″ longer or more, then the trained that cutting to grow into a single stem tree. 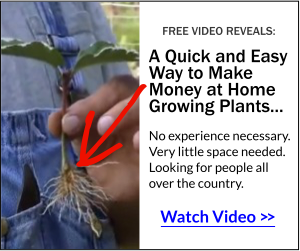 Training a Flower Shrub to Grow as Tree is actually pretty easy and fun to do. Dappled Willow has spectacular color in the spring and typically grows as a large shrub that sprays outward then weeps slightly, much like the shape of a forsythia. But in the early spring the color is striking and people come to our nursery asking for them. Salix integra ‘Hakuro Nishiki’ tree form from a cutting. Dappled Willow is super easy to grow as a shrub and is hardy in zones 4 through 9. As a tree form they are also easy, but you have to keep picking the new buds off the stem as they appear so they don’t make branches down low. I took these photos and we shot a very soggy video at Roger’s Backyard Nursery in Cranesville, Pa. Roger is one of our members. A machinest by trade, but Since Joining Our Backyard Growers Group he has become quite the plant propagator and quite the nurseryman. Roger’s yard is only 1/2 acre lot and he has it packed full of plants that are growing, rooting and plants for sale. He does a nice little retail plant business from his home and he sells a lot of plants to other members. Enjoy the video and turn up your volume a bit, the rain made this challenging and being soaking wet in 37 degrees temperatures should have taken all of the fun out of this but it didn’t. Duston and I had a blast hanging out in the rain with Roger, but we need to go back when it’s warmer. Greetings from Nova Scotia – zone 6b! I would greatly appreciate your advice after searching in vain for answers on the Internet. I have propagated about 50 dappled willow cuttings successfully – much to my astonishment. I simply put each cutting in soil in its own pot. Within a week I have small leaves growing from the nodes on the cuttings. I fully intend keeping them through the winter in our small greenhouse that we will heat with 2 hurricane lanterns to take the edge off the deep winter cold. I am reluctant to plant these into the ground in Oct or Nov as the few roots I caught sight of seem spindly and frail, I just don’t think they’ll survive hence the greenhouse idea. So my questions are will this work? Do I still allow them to become dormant over the winter? As I mentioned the lanterns are just to help with the minus temperatures so I would imagine these cuttings will still want to “hibernate”. Many thanks in advance! Will the single trunk on a dappled willow grow strong enough to support the top? All the info I can find on a standard form says they need to be grafted onto a compatible willow trunk. ..
Grafting is the typical way that they are grown, but I’m pretty sure the stem will support the top as long as you keep the top under control. The good thing that it costs nothing to try and you can produce one in a relatively short period of time. If I were to spend time grafting plants I’d do Japanese maples, not Dappled Willow. Mike, I bought your book on propagation a few years ago. I haven’t gotten around to starting like I would like to but I am putting up a small (8×12) greenhouse. I am going to try to air prune a lot of the plants. Especially trees. Really interested in your group. How much is it to join. This really gets me going. It feels good to get outside and grow things. I think I make it harder than it is. It’s not simple though, but I can do it. It’s only $7.00 to test drive our members area, http://backyardgrowers.com/join. Take the test drive. There is no way in the world to fully comprehend what it’s all about until you spend $7.00 on the inside. Opens again on May 5th.